Adam Theis is one of those Bay Area music scene figures whose cup runneth over with so much talent, you've likely heard him without realizing it. He's the founder of the locally beloved collective Jazz Mafia; has co-written songs with Blackalicious, Zion-I and Lyrics Born; and performed as a sideman with KRS One, Booker T. Jones and J Boogie's Dubtronic Science. One time, in 2009, Stevie Wonder crashed one of his shows at an intimate club in the Mission district and performed two songs with his band. He's that good. 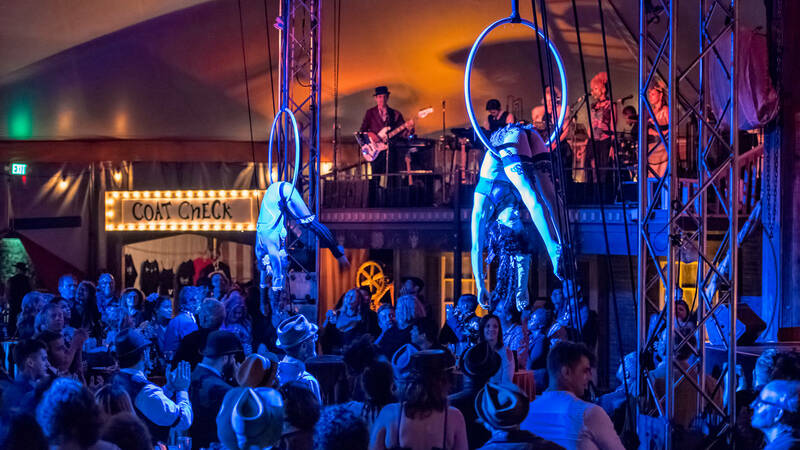 Theis' latest project is a Jazz Mafia collaboration with the Vau de Vire Society, a circus arts collective comprised of dancers, aerialists and contortionists with an avant-garde edge. Their new production, The Soiled Dove, takes place inside a giant red tent down the block from the Fox Theater in downtown Oakland. Jazz Mafia perform a live soundtrack at the event, which runs every Friday and Saturday through Nov. 17. The music is also available on Bandcamp—though the pole dancers and acrobats won't come with your download.